Many transition metals react with bases (such as ammonia) to produce beautifully colored transition metal-ligand complexes. The word ligand comes from the Latin ligare which means to tie or bind. The same root leads to ligaments, which tie your bones together. 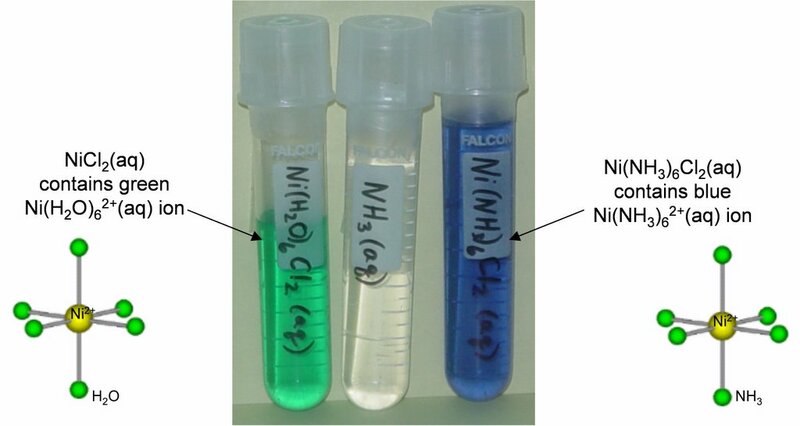 The photo shows green Ni(H2O)62+ and blue green Ni(NH3)62+. The ligands are water and ammonia respectively, "tied" to the Ni(II) center. The ligands form an octahedron around the metal center.